Get Work Area - This tool takes the in and out points of the work area for the selected composition and sets the beginning and end frame numbers for you! This makes it easy to visualize exactly what portion of your composition you want deleted. Get RQ Item - This tool prompts you to input in a RQ Item index number and output module number to grab the image sequence source and start and end frames from. This is helpful in that, if you've got a RQ Item that is set to render to an image sequence and you want to delete frames from that sequence, you don't have to browse for the image sequence, it is taken from the output module of your selected RQ Item! Future versions of the SSD script will contain even more tools to greatly speed up the process of working with image sequences so stay tuned! Browse - Click on "Browse" to select a frame from an image sequence on your file system. Any frame from the image sequence will do! 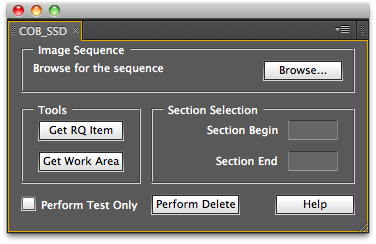 Alternatively, you can click on "Get RQ Item" to choose an image sequence file path from your render queue. Get RQ Item Path - Click on "Get RQ Item" to select an output module to grab the image sequence path from. If there is only one RQ item and it only has one output module, this output module is automatically selected without any futher input. Start and end frames of the output module are automatically entered in as the start and end frames to delete. Define the beginning and ending frame numbers for the section of the sequence that you want deleted. You can do this by manually entering in the frame numbers or by clicking on "Get Work Area" to automagically grab the in and out frame numbers of the workarea in the currently active composition. Enter in a start and end frame for the range to delete. If you've used the "Get RQ Item" button, these are set as the frame range of the output module. You do not need to pad the frame numbers with zeroes. When you're ready, click on the "Perform Delete" button to begin deletion. Don't worry, a confirmation prompt will appear asking you if you are really sure you want to delete the sequence section. Feeling a little bit insecure? That's ok, click on the "Perform test only" checkbox to indicate you want to perform a dry run and verify the files that you were wanting to delete will actually be deleted. When checked, no confirmation prompt is displayed since no deletion is performed. Note: The developer is not responsible for the loss of coffee breaks normally used to wait out a sequence deletion.